Just because a mortgage or credit-card company will give you money doesn’t mean you should take it. According to your lender, you may qualify for more debt than you can afford in your current situation or to meet your long-term financial plans. And the guidelines that many companies use to determine whether you’re in a good position (or financially “healthy” enough) to increase your indebtedness aren’t always in your best interest. Before you take on more debt, you need to determine the amount of money you can afford to borrow while still having money available to do other important things in your life — now and in the future. When calculating your allowable amount of debt, you need to know two terms: front-end ratio and back-end ratio. Your front-end ratio is your total monthly housing cost divided by your gross monthly income. 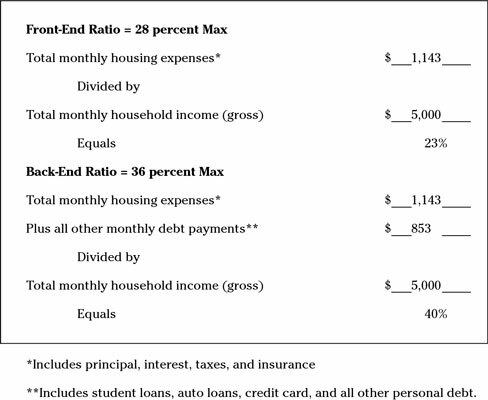 The back-end ratio is the total of all of your debts and your housing costs divided by your gross monthly income. When adding up these expenses and debt, your front-end ratio should never exceed 28 percent, and your back-end ratio needs to stay at or below 36 percent. 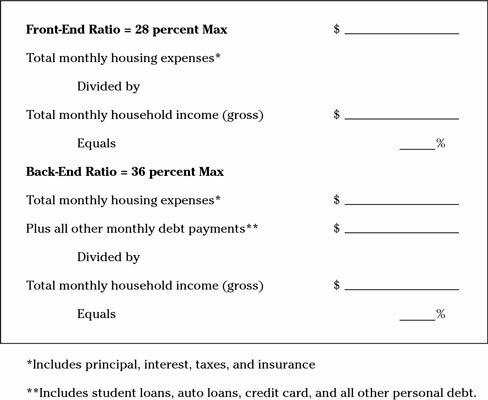 In this worksheet, you can see that the borrower passed the front-end ratio but failed the back-end ratio. The combination of housing costs and other debts eat up 40 percent of this borrower’s gross income. Remember, another 25 to 30 percent goes to income taxes and Social Security taxes. Your front-end ratio should be below 28%. Your back-end ratio should be below 36%. Click here to download and print the Maximum Debt Ratios form. If you breach the front-end or back-end ratio, you’ll find yourself struggling to make ends meet, let alone achieve any other financial objectives you may have. If you find that you’re already breaching one or both of these ratios, you need to start getting rid of some debt.